Bourbon: A type of American whiskey with a strong connection to the South, especially Kentucky. Over the past 10 years, bourbon has become increasingly popular, with people even going as far to “flip” rare bottles for extreme profit. A delicious and complex spirit, it can be served neat, over ice, cut with water or mixed into cocktails. For many, bourbon is considered America’s “native spirit,” with tradition and legacy deeply rooted in our nation’s history. In order to legally be called bourbon, the mashbill (the specific recipe) must be a grain mixture made with at least 51 percent corn, distilled domestically in the U.S. to no more than 160 proof, put in the barrel for aging at no more than 125 proof, then bottled at no less than 80 proof. The whiskey must also be aged in new charred-oak-wood barrels. These are the primary federal standards put in place by Congress in 1964 in order to call a whiskey a bourbon (although there are a few more). If you haven’t picked up on this yet, Americans take their bourbon very seriously. There are six primary categories that aficionados use to classify this beloved spirit. Get to know these, and you’ll have a good foundation for understanding what to look for in terms of flavor. You'll also be able to impress your friends at the next cocktail party. These bottles of bourbon come from one barrel, not a blend a many. 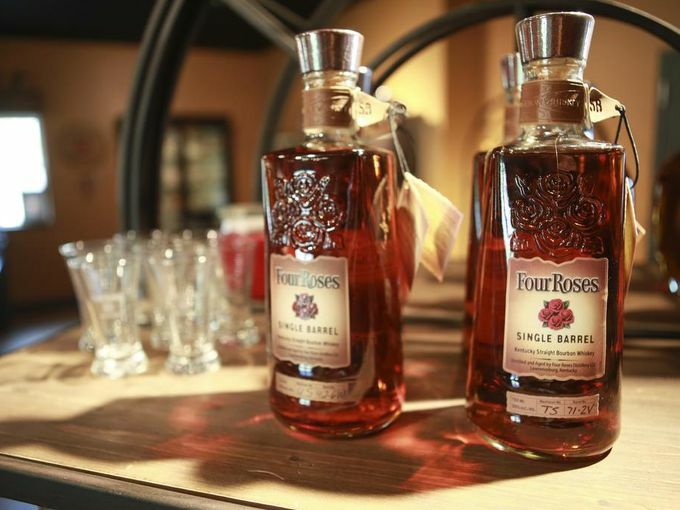 Within the same brand of single-barrel bourbon, flavors will vary from barrel to barrel since the wood density, char and aging conditions will differ. Blanton’s was the first single-barrel bourbon to emerge onto the market, in the 1980s. For daily drinking at the midlevel price point, we are a huge fan of Eagle Rare. These bourbons pack a punch and are known for being some of the most flavorful in the whiskey world. Before going into the barrel, bourbons are mixed with water to reduce their alcohol content below the 125-proof regulation. During the aging process, the water evaporates; when the barrel is emptied, the spirit is often higher proof than when it entered. Before bottling, most bourbons are again cut with water to achieve the distiller’s desired proof. But not cask-strength bourbons. These are intense full-flavor bourbons. Cask-strength or barrel-proof bourbon drinkers will sometimes cut their pours with a few drops of water to nudge them to their own flavor preference. Since these bottles come straight from the barrel, there tends to be a spice-forward palate with notes of burn and char. One of the most popular cask-strength bottles we know (and love) is George T. Stagg. Often known as wheaters, distillers use a high percentage of wheat in the mash bill for these bourbons. This yields a less spicy, less sour and less floral taste to the end product. These bourbons are typically known for being nutty and soft on the palette. The holy grail of bourbon, Pappy Van Winkle Family Reserve, is the most famous wheated bourbon. The core ingredients of any bourbon are corn, barley and rye. Traditional recipes tend to have about 10 percent rye, but a few bourbons go beyond this level, making for a more bold, spicy flavor. A few examples of high-rye bottles you may have heard of: Bulleit, Four Roses Single Barrel and Redemption High Rye. Bourbon must be at least 51 percent corn, according to regulations, but a few go higher. These bourbons, known for their sweet flavor, are not to be confused with the separate category of corn whiskey. We are a fan of the Hudson Baby from Tuthilltown Spirits, which is made with 100 percent New York corn. Small batch is an increasingly prevalent term in the world of bourbon, though there is no real definition of what a small-batch bourbon actually is. Most producers use it to refer to a bourbon produced by mixing the contents of a small number of select barrels. A distiller's flagship bottle could contain a bourbon mixture from hundreds or thousands of barrels, so small-batch products offer more freedom to experiment and more variation in taste. Small-batch bourbons are produced in smaller quantity, and the distiller will often note the batch or barrel number on the bottle. Woodford Reserve and Basil Hayden's are two of our small-batch recommendations.